Published on December 2, 2014 in General T&T, Media and Religion. 8 Comments Tags: Heritage site, Newsday, Rodger Samuel. This is how Minister of National Diversity and Social Integration, Rodger Samuel, saw the demolition of the historic Greyfriars Church of Scotland on Frederick Street, Port-of-Spain, on of all days, Sunday, the Sabbath for most Christian faiths. 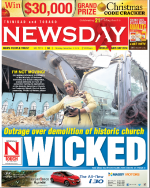 Samuel, a pastor, lamented the near complete destruction of the church even as his ministry has been in talks with its 84-year-old owner businessman, Alfred Galy, on preserving it as a heritage site. Even more outraged than Samuel was his adviser, Dr Nurah Rosalie Cordner who risked her life, climbing onto an excavator to stop the demolition crew of contractor, Don Ramdeen & Co, from tearing down the centuries’ old church.